I picked up my shiny new copy of Retro Gamer this morning to read during the work lunch break (the earnest intent to get my reading of War and Peace done during that half-hour didn’t quite work out, not least because it involved lugging a book the size and approximate weight of a brick about with me) and spotted something on the homebrew pages: a Megadrive port of Oh Mummy. Yes, really. Amstrad CPC and ZX Spectrum owners will be familiar with the old “run around tombs like a nutter looking for the key and sarcophagus” simulator of yester-decade. 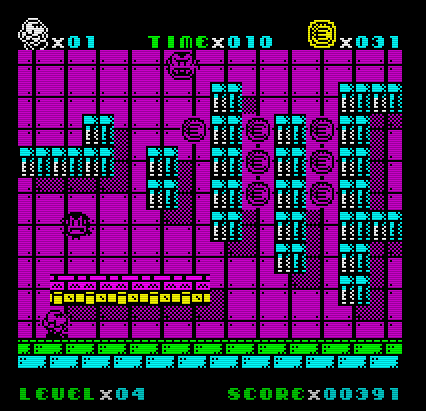 Spectrum owners of a certain vintage in particular will remember the game because it came packed with Lord Sirallan’s grey reboxing of the Sinclair machine as one of the pack-in games alongside Disco Dan and Space-o-Zap or something. Anyway, I’ve always had a small soft spot for Oh Mummy so I’m intrigued by this new 16-bit incarnation for Sega’s great-console-with-a-rubbish-name. At the moment it seems to be available only on cartridge for the real hardware (which, to be honest, is as it should be) but the option to buy it as a downloadable ROM might appear at some point in the near future. Further details of the new 16-bit port here (in Spanish, so you might need a translate-o-browser). I was stuck on this stage, but I know how to do it now. Bwah ha ha! A quick challenge for the weekend/coming week if you’ve nothing better to do. This was inspired by someone putting up a YouTube video of this game which I recall playing a couple of times on release and then moving my attention onto something else, probably an amusing picture of a cat or Radio 7 or something like that. Download the Mojon Twins rather good platformer Uwol, Quest for Money (that links to the Spectrum version although there’s also a Sega Megadrive flavoured release (bottom of that page) if you’re that way inclined) and try and complete it by this time next week. I’m going to give it a go (I nearly reached the bottom of the pyramid on my third or fourth go) and I’m insisting you all join me. You need to collect 255 coins to win the game and if you get to the bottom you’ll be sent to the top again and need to make sure you go to the rooms that aren’t already empty of coins. Let me know if you manage it.